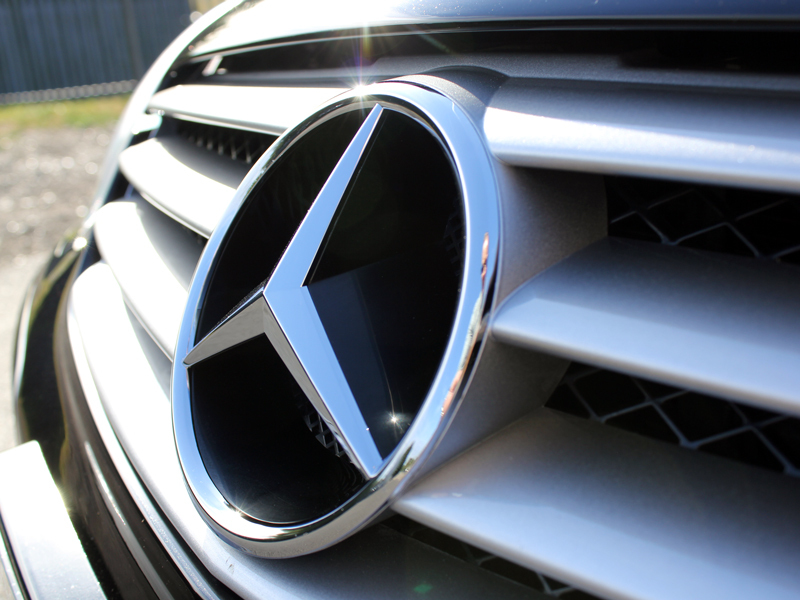 The Mercedes SL55 AMG 5.4L V8 Kompressor is also known amongst Mercedes Benz enthusiasts as ‘The Hammer’. 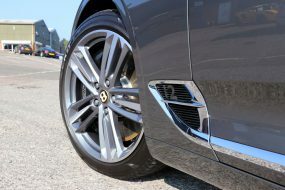 The ‘kompressor’ designation indicates it is supercharged, so it’s not surprising it has an impressive 0-60mph in 4.9 seconds and is rated at 493 hp. With a suave and refined interior and a classy, elegant exterior, the SL55 AMG truly is a gentleman’s sporting dream. This SL55 AMG had sustained some damage when a piece of wire had been caught in the tyre tread, dragging the wire around the outside of the rear wheel arch and scoring it deeply. In addition the near-side front wing had sustained some ‘car park’ damage and also required attention. Ultimate Detailing Studio arranged for both areas to be repaired and resprayed and for the front wing badges to be replaced prior to the Gloss Enhancement Treatment being carried out. 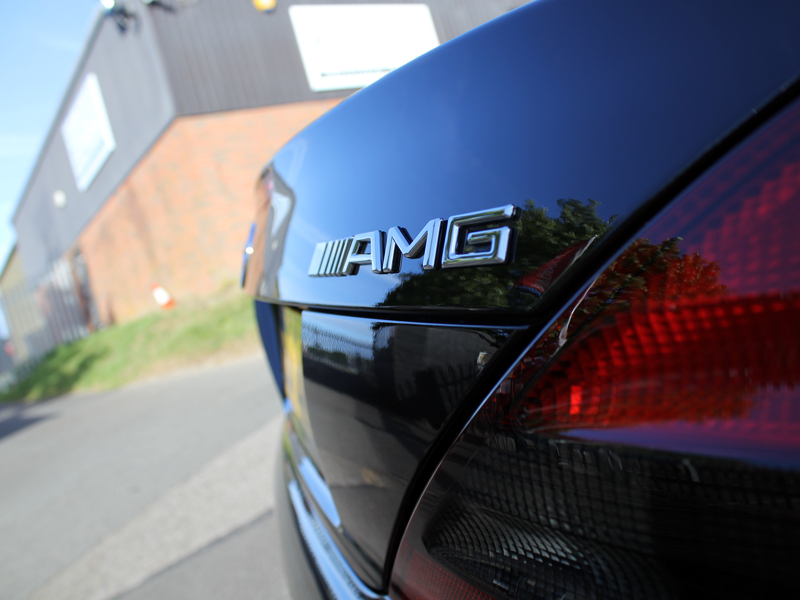 Once the respray had been completed the SL55 AMG was prepared for detailing. 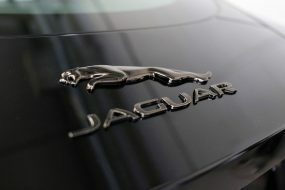 Initially the bodywork and wheels were treated with Bilt-Hamber Korrosol to remove build-up of iron contamination. This is usually deposited when brake pads shred, so can be collected not only from the car’s own brake pads but also from cars in front whilst driving along. Korrosol has a colour change function, turning a dark purple when in contact with the iron contamination. This allows the detailer to see the product working and when the colour no longer deepens the contamination can be freely rinsed away. Once the iron contamination had been removed the wheels were cleaned using Bilberry Wheel Cleaner before being jet washed to remove all residue. 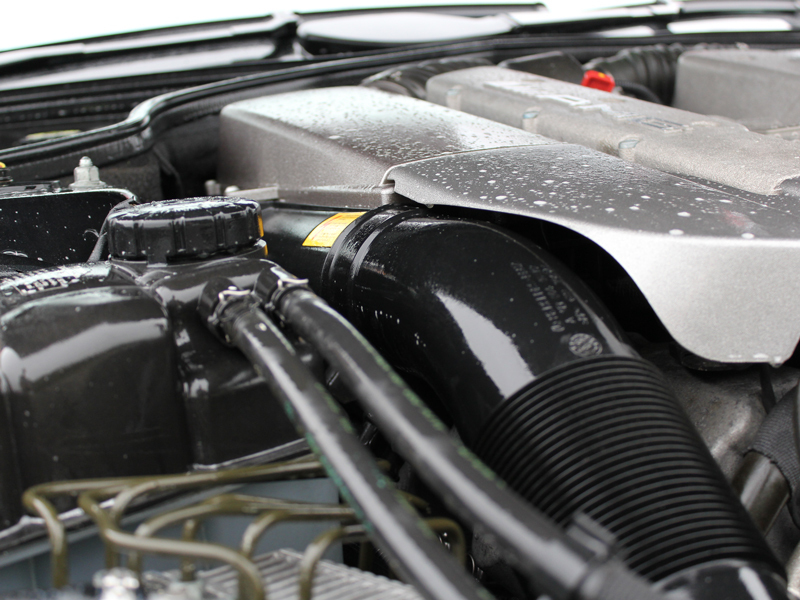 The engine and bodywork were degreased using Bilt-Hamber Surfex HD, a water-based, biodegradable degreaser which easily removes oil residues, tar and tree sap. The engine and bodywork were then rinsed clean. 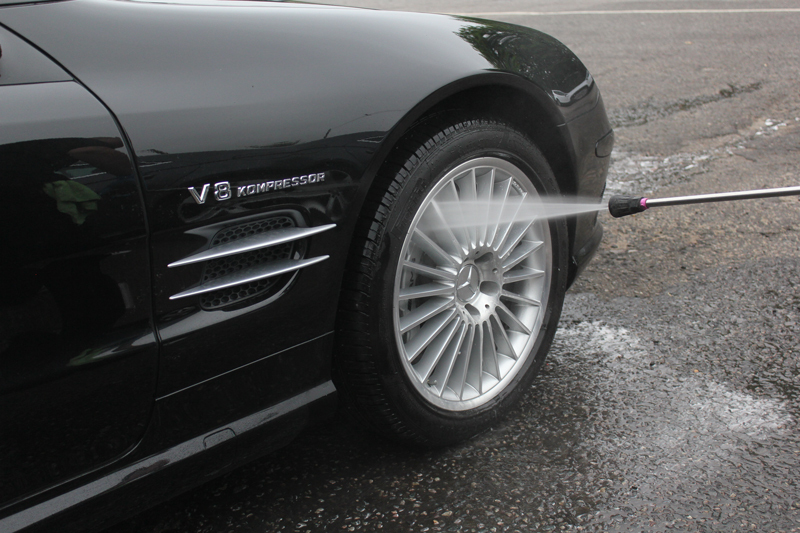 The next stage was to pre-clean the car using Ultimate Snow Foam through a pressure washer lance. 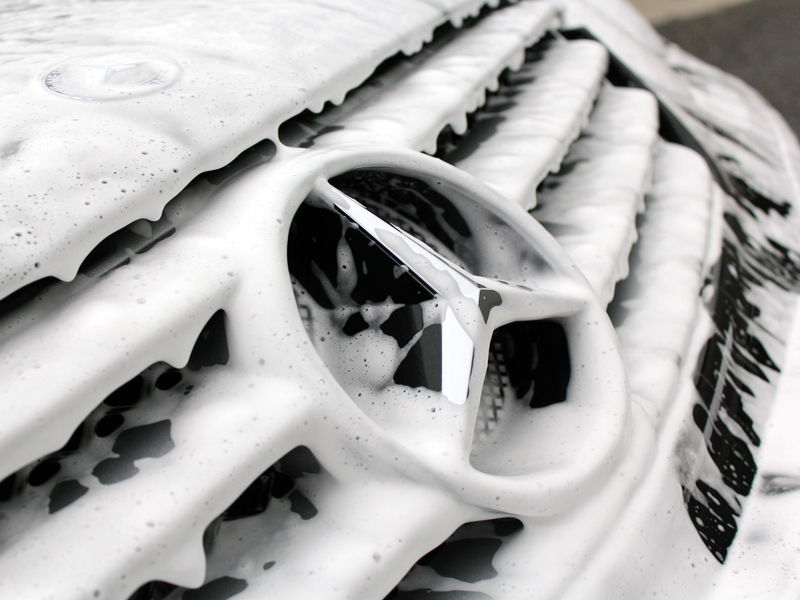 Ultimate Snow Foam is a high foaming product which lifts larger particles of dirt away from the bodywork of the vehicle. 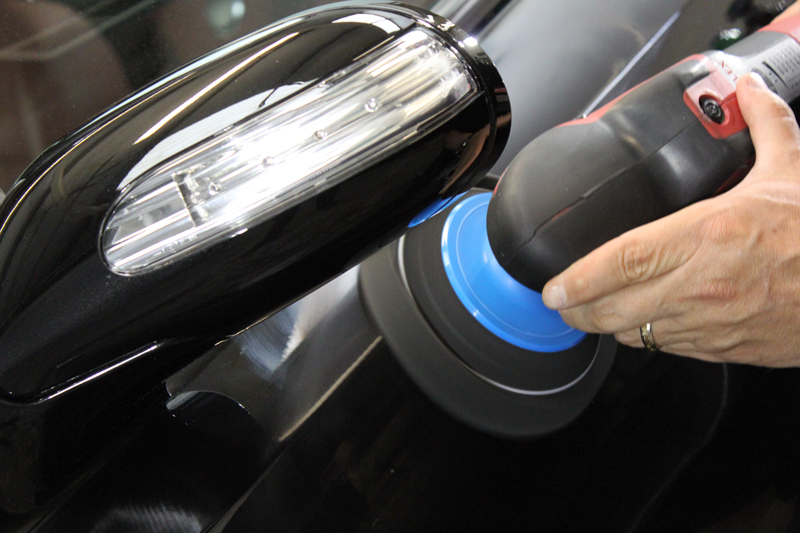 This helps to prevent scratches being introduced during the main wash process – particularly important for black and darker coloured paintwork which show up blemishes readily. 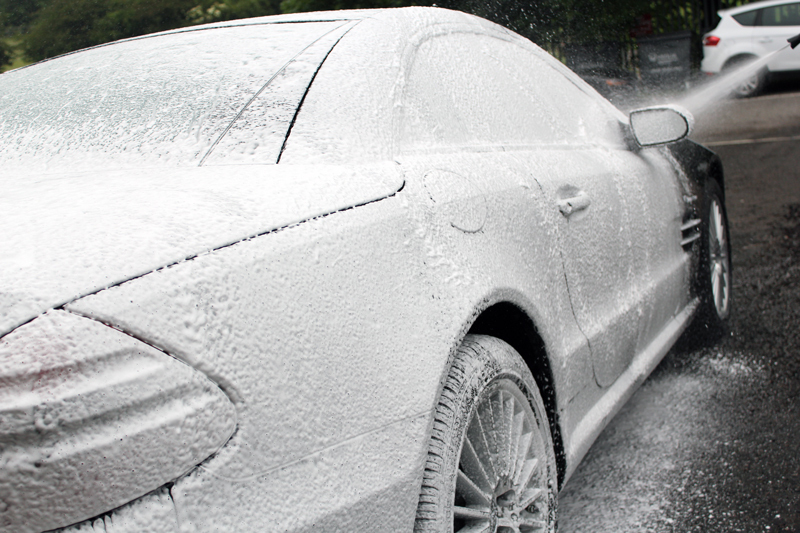 Once the Ultimate Snow Foam has been allowed to dwell for several minutes the SL55 AMG was rinsed and then washed using the Two Bucket Method, a Microfibre Madness Incredimitt and POLISHANGEL® Glissante Carnauba Gel Shampoo. The car was then thoroughly rinsed clean. 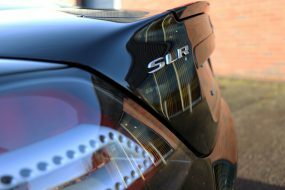 Once the SL55 AMG had been dried using soft, clean microfibre drying towels the paintwork was inspected using a RUPES Swirl Check Portable LED Light, after which the UDS Master Detailer selected the FLEX PE14-2-150 Rotary Machine Polisher, Polish Angel Master Compound I and a 3M Yellow Polishing Pad. 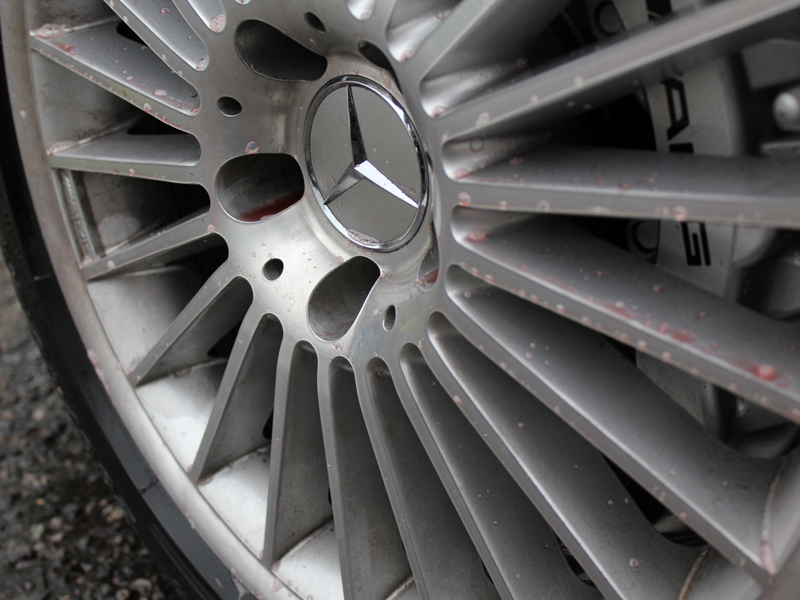 The alloy wheels were cleansed using Gtechniq Panel Wipe to ensure any polish residue or cleaning agent was removed. 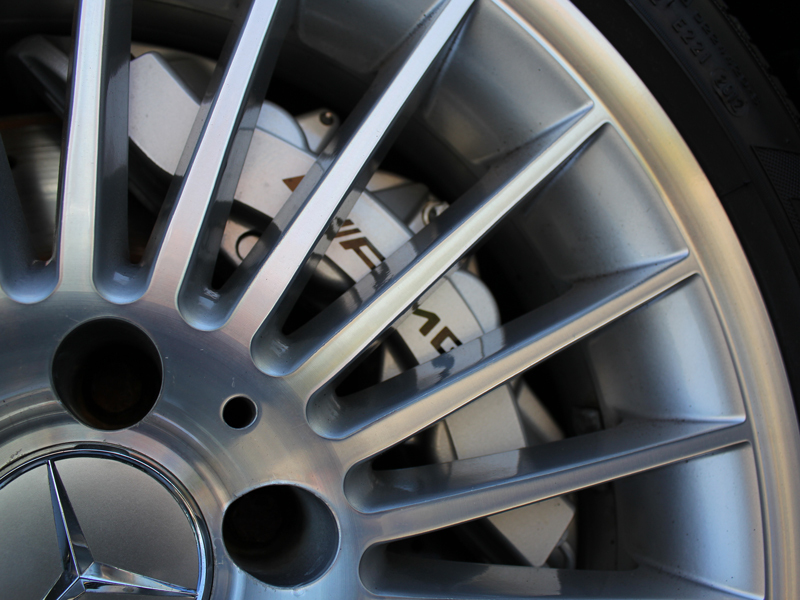 Then Gtechniq C5 Alloy Wheel Armour was applied and allowed to cure. C5 is a highly heat resistant glass coat based on nanotechnology, forming an extremely tough water and oil resistant barrier. This makes wheel maintenance easier in the future. 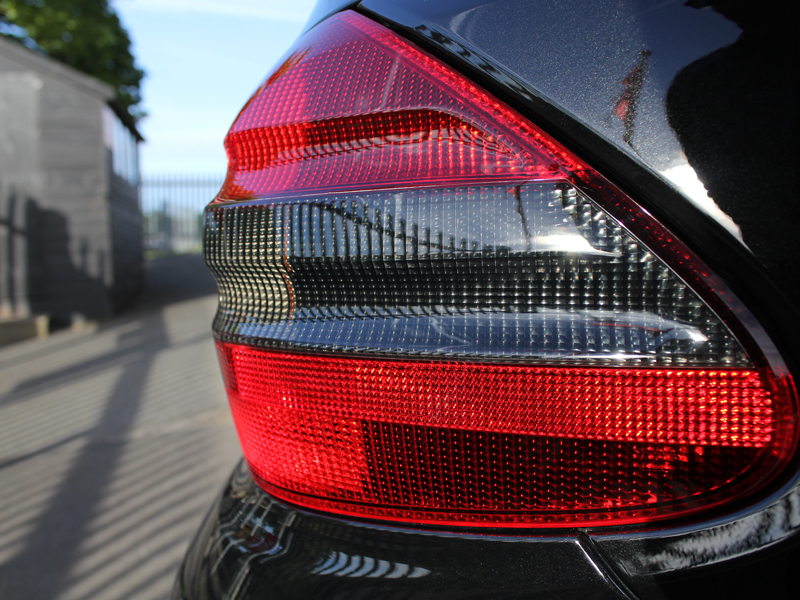 The plastic covers of the headlights and rear lights were protected using POLISHANGEL® Glasscoat | Cosmic 9H to help prevent hazing and oxidation from UV degradation and environmental fallout. 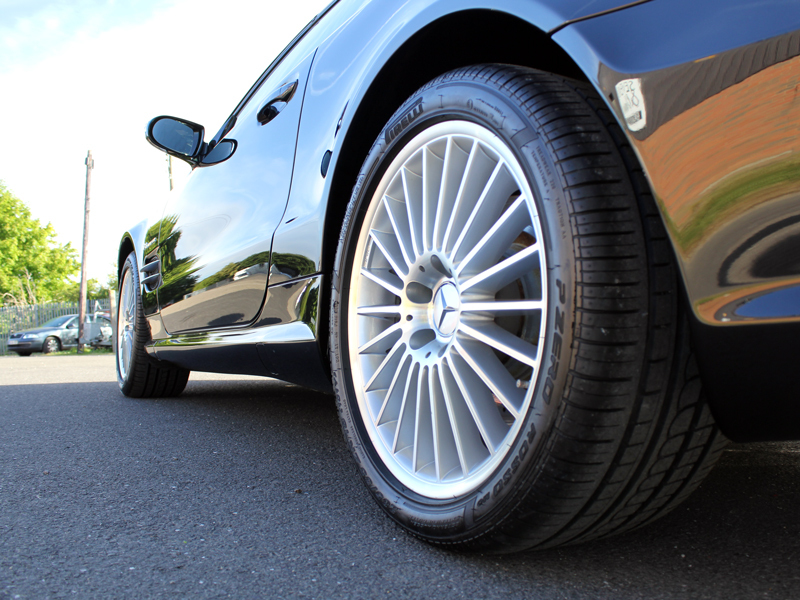 The tyres were treated with Swissvax Pneu to give them a natural satin sheen. The exhaust tips were polished using Gtechniq M1 All Metal Polish, a chemical cleaner which leaves a true lustre. 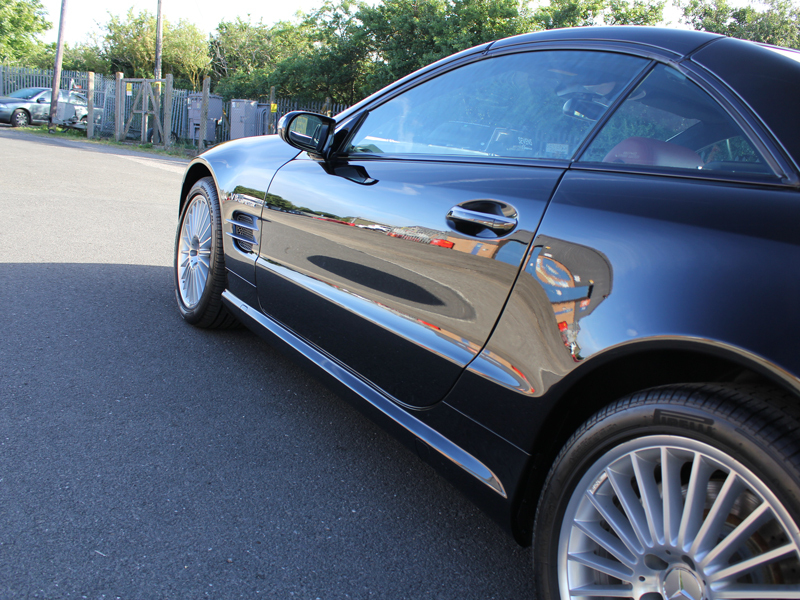 When the customer collected the SL55 AMG the sun was shining, showing off the refined, deeply glossy paintwork to perfection. 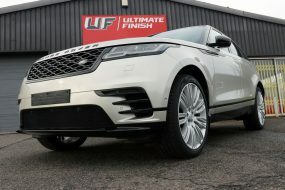 Needless to say Ultimate Detailing Studio had another very happy customer! 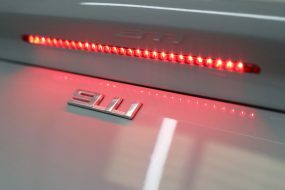 BMW i3 eDrive – The Future Has Arrived In Style!